The above animation is just to give you an idea of what some things look like when they get in the way. 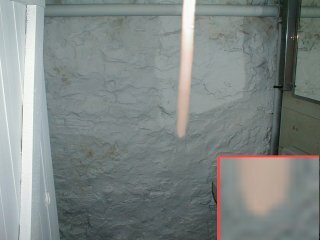 So how can you decipher a ghost from a lens cap string? I don't think there is any one right way to tell what is what, but here are some things that I have discovered while taking these picks. Take a look at how the lighting changes from image to image. An object right in front of the flash is going to cast a shadow of some sort and change the lighting. 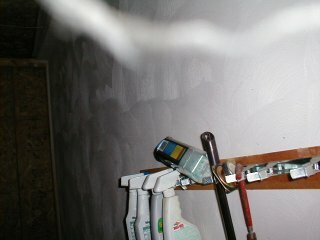 This will effect just about any type of camera no matter where the flash is situated. Of course if you only have one picture its kind of hard to know if the lighting changed from one pic to the next. 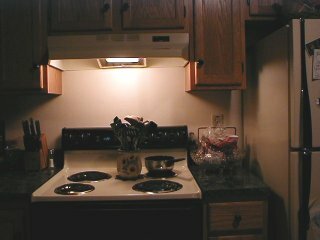 Any of these objects can look completely different depending on the distance from the camera and how much light is reflected from the flash. Of course shadows are only going to hold true if there is something to cast the shadow on, but take a look through your pics and keep in mind some of the little details. Dust will not cast a shadow either since its to small to do so, but it may change the lightning if its right in the flash path, so be alert of lighting changes in your pics. This one was kind of strange. This is a piece of my wifes long hair placed in front of the lens during the picture. Whats so strange about this one is that it does not extend the length of the picture even though the hair was completely in front of the lens and should have made a streak the entire length of the image. I took a sample of the hair and a sample of the floor in the back with the rug and blew them up 400%. As you can see something right in front of the lens does not get as grainy as something off in the distance. This may help decipher if something is right in the lens with a digital camera image. So if that hair extends all the way down accross the lens, why does it only show up 3/4th the way down? Here is another pic to compare, not that you really want to see pictures of my house, but here is my stove. I picked this because it has light and dark transitions. Believe it or not, there is a hair hanging right in front of the lens for this pic to, but you can not see it. The simple fact here is that the camera is focusing on the largest object in the picture, in this case, my stove. So the hair is overlooked. And this would be the case with any type of camera. The only reason you can see it above is because the flash reflected back into the camera from the hair. The hair disappears towards the bottom since that portion of the hair is not reflecting any light, so as in the stove picture, it just disappears. If you want to take this a bit further, you can try a little experiment while sitting right in front of your computer. Find yourself a hair (pull one out, check your chair, pull one from the cat, etc..). Put the hair right up to your right eye and focus on it. Once you have the hair in focus, now unfocus to your computer monitor. The hair just disappears (well you might see it a little, but for the most part its gone). Since a camera works much like the human eye, it will not pick up the hair just as you could not see it when you focused on your computer monitor. Kind of funky, but you get the idea of what is going on with the two pictures above. Here is my hand at creating an image using the image above and splicing the hair into this image to create a vortex like image. This is alot harder then you think, but many of the graphics programs these days make it much easier to merge two images together or just add in effects that can look ghostly. The bottom corner is a blow up of the bottom of the fake vortex. As you can see the pixles are blury as opposed to the actual image around it. This may give you an idea that something has been inserted into the image. If I would not have blured the inserted selection a bit, it would look very choppy and easy to tell that it was inserted. Unless the artist is a pro, there is probably going to be some flaw someplace that will allow you to decipher a fake from an original. Here is a picture of something that is really hard to find during the month of March in Pennsylvania. I ventured into my garage and searched high and low and finally found a small bit of cobweb. If you are exploring an old building or other place that may have these hanging around, you may want to be careful where you are standing when taking that picture. Once again, take a look at the lighting and how much is reflecting off the cobweb, its definently within inches of the lens. 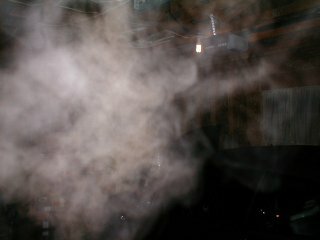 Cigarette smoke can be a serious problem as well, betcha can't tell what kind of car I drive through all that smoke? 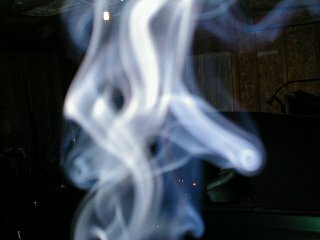 This is nothing more then a cigarette just below the lens of the camera, but again, you can tell its right in the lens because of the reflection off the smoke and not being able to make out the background. Of course for a pic like this, it needed to be taken inside or on a really, really calm day. Smoke in the wind is going to look much different if not show up at all. And finally, the biggest culprit is just breathing! 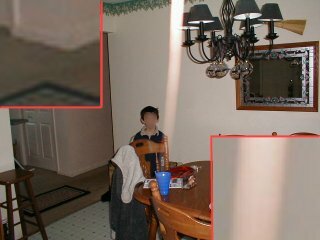 You would be suprised how a camera can pick things up that you can not see, thats why we ghost hunt with cameras in thr first place. Of course it was cold enough for me to see my breath when I took this picture, but in some cases, its just cold enough for the camera flash to reflect off of it and you can not see it by just breathing out. And once again, we are back to the lightning, still can't tell what I drive can you? This is definently right in front of the lens. So what does all this mean? The above photos are just to give a little insight of what to watch out for. I took these photos with my digital camera, but any of these can effect an average film camera as well. The bottom line is to be extremely careful when taking pictures to avoid the above problems. If you have long hair, tie it back. Take your camera strap off. Be sure to hold your breath during a picture and take a look around for anything that may get in the way or cause a reflection. If you can afford it, take several pictures from the same spot on a tripod if possible. Digital pictures are free, the more pictures the better the proof that something was actually there and not something in the lens. I must also again say, I am not a professional at this, nor do I have all the answers, the information I am giving here is just a little logic and a little experience with cameras. If you see anything that you disagree with or want to add something, please e-mail me and let me know.